January 11th, 2014 marks the 17th WDW Marathon Weekend Half Marathon. My husband was lucky enough to earn the 15th year medal when I was 6 months pregnant with our 2nd child (lots of numbers!). Though I can't run the Walt Disney World Half Marathon this year, I'm excited to be a part of this great Virtual runDisney Blog Hop! My first half marathon ever was the Walt Disney World Marathon Weekend Half Marathon, presented by Cigna. This annual race will be 17 year of this particular event - and it gets more popular every year. I absolutely adore #runDisney. The runDisney brand has created incredible events - and, when there are problems (like the 5k royal 'family' fun run last year), they learn from their mistakes and make changes. The idea of waking up at 2 am to head to a race can be intimidating, however, seeing Spaceship Earth at Oh' dark thirty makes it worthwhile! The DJ's are playing music to pump you up, the crowds mill in, and the excitement builds as you wait for race time. As part of race teams, I've had meet ups prior to the runs and there was plenty of time to meet up with friends, both old and new. There are even characters for meet ups - and yes, the lines are long, but what else do you have to do? Find the porto-potties, socialize (if you're able to do so at 4 am), and wait - not too bad! The best part of Disney races is the show. In true Disney fashion, Disney puts on a GREAT show. From the countdown and fireworks (yes, fireworks) to start off the race, to the entertainment along the entire route. Water stops/gu stations along the way, first aid - it is the most organized and well maintained race I've been seen (and heard that it is the best from people who have done more than my 5 or 6!). The entertainment and characters you can meet vary from race to race. Because Marathon Weekend is incredibly coed (as opposed to Princess which had only about 6% of the runners male), the entertainment is varies - Prince and Princesses, Pirates, Cars, to the bands like Off Kilter and local school bands. You won't know what you will see and hear until you are there - but it is always an exciting surprise to pass different characters in their various locations! Roads close and traffic backs up EARLY - don't miss the start of the race by leaving your resort/hotel late! Headphones are not recommended - but that doesn't mean you can't wear them! Consider not worrying about time - these races are run and in places you don't get to see on a regular basis! 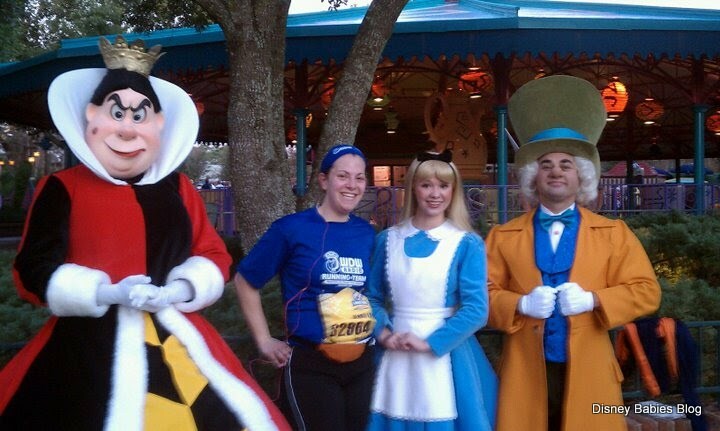 I love running to meet characters and enjoy the scenery and will probably never set a record during one of my #runDisney races! Great job - and I couldn't agree more - there are always more portopotties along the way. And actual, real bathrooms! Jenn, I just love the sense of history and experience that you bring to this event! Congrats to your hubby on a 15 year medal- what an achievement!! This particular runDisney weekend was my first too, and the show- the entertainment was what hooked me too. I like to think that contrary to most Disney shows, running these events makes US all performers and cast. As I said, "on with the show"! !